I PERSONALLY LOVE WHEN I GET THE OPPORTUNITY TO HEAR ABOUT THE INSPIRATION AND THE STORIES THAT FUEL THE CREATIVE PROCESS - ESPECIALLY THOSE OF CREATIVE DIRECTORS OF GLOBAL FASHION HOUSES SUCH AS GUCCI. SO, IN LIGHT OF MY PERSONAL LOVE OF KNOWING THE BACKSTORY, I’M GOING TO SHARE WITH YOU ALL THE BACKSTORY OF THE ZUMI, AS WELL AS A FEW OTHER PIECES I ADORE. THE ARLI MEDIUM SHOULDER BAG. 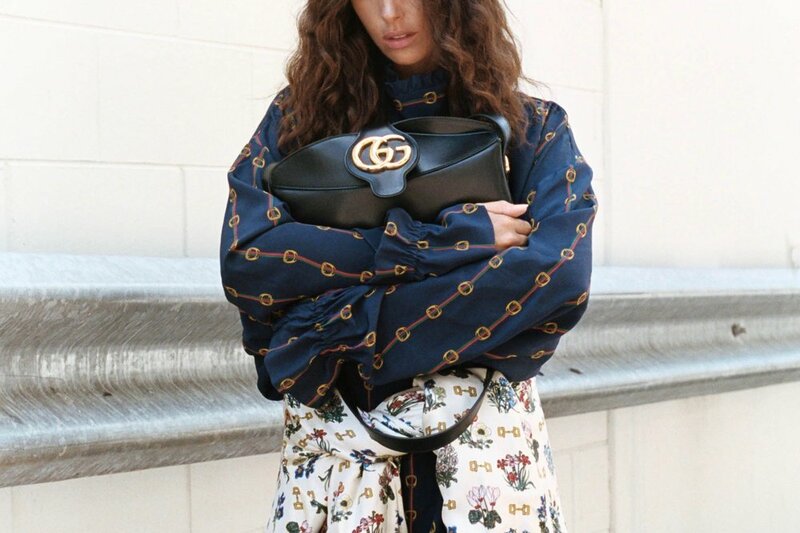 BROUGHT BACK FROM THE 1970S ARCHIVE, THE DOUBLE G HARDWARE AS FEATURED ON THE ARLI, DEFINES A NEW LINE OF GUCCI SHOULDER BAGS. 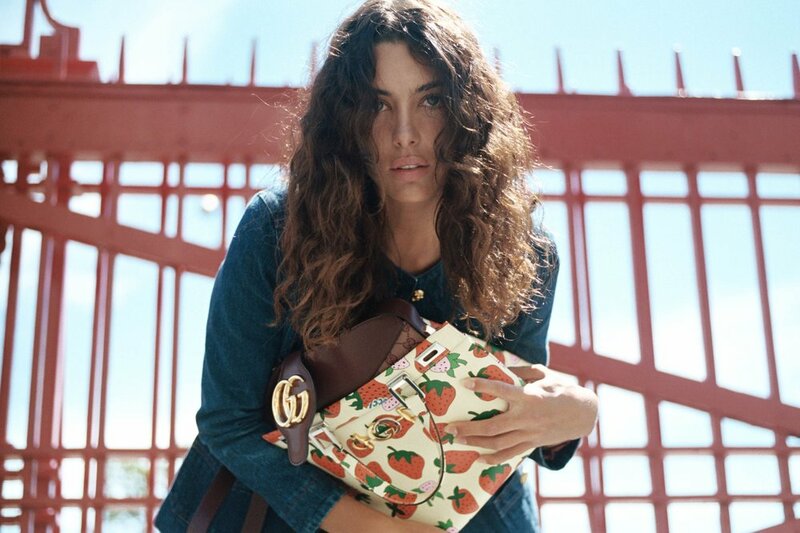 THE BAG WAS FIRST PRESENTED IN THE CRUISE 2019 COLLECTION. THE LINE IS NAMED ARLI AS THE CRUISE COLLECTION WAS PRESENTED IN THE PROMENADE DES ALYSCAMPS, AN ANCIENT ROMAN NECROPOLIS IN THE TOWN OF ARLES, FRANCE. AN EVOCATIVE SETTING. THE LEATHER MID-HEEL PUMP WITH HALF MOON GG. THE GG MOTIF CAPTIVATES ONCE AGAIN. THE PERFECT PUMP, CLASSIC, TIMELESS AND GLAMOROUS. SAY HELLO THE GUCCI ZUMI. YES, THE BAG ABOVE COVERED IN STRAWBERRIES THAT’S GENTLY RESTING ON MY HEAD. THIS BEAUTIFUL NEW SHAPE, WITH A MIX OF CONTRASTING ELEMENTS WAS NAMED AFTER ZUMI ROSOW. ZUMI IS AN EXPERIMENTAL MUSICIAN AND ACTRESS WHO ALSO WALKED IN THE GUCCI SS19 RUNWAY SHOW IN PARIS (WITH HER BAG IN HAND, OF COURSE). UNCONVENTIONAL AND MODERN, THE EPITOME OF A FREE SPIRIT, ZUMI ROSOW EMBODIES ALESSANDRO MICHELE’S VISION OF BEAUTY. THE ZUMI HARDWARE COMBINES TWO OF THE MOST HISTORICAL GUCCI HOUSE MOTIFS, THE INTERLOCKING G AND HORSEBIT. THE HARDWARE ON THIS BEAUTIFUL PIECE IS REPLICATED FROM A RARE PIECE IN THE GUCCI ARCHIVES, CHOSEN BY ALESSANDRO MICHELE HIMSELF FOR ITS MODERN, CONTEMPORARY APPEAL. A CLASSIC PIECE THAT SITS ALONGSIDE THE ARLI MEDIUM SHOULDER BAG. ANOTHER INCREDIBLE RETRO-INSPIRED BAG, THE RAJAH TOTE IS ONE OF MY PERSONAL FAVOURITES. THE TIGER HEAD MOTIF FINISHED WITH COLOURED ENAMEL AND SPARKLING CRYSTALS IS INSPIRED BY A VINTAGE PIECE FROM LEGENDARY FASHION AND JEWELLERY DESIGNER HATTIE CARNEGIE'S 1940S ARCHIVES.